In 2005, eight Indigenous intellectuals created the volume For Indigenous Eyes Only: A Decolonization Handbook, to offer hands-on suggestions and activities for Indigenous communities to engage in as they worked to develop decolonizing activities. Beginning from the assumption that Indigenous Peoples have the power, strength, and intelligence to develop culturally specific decolonization strategies to pursue our own strategies of liberation, we attempted to begin to demystify the language of colonization and decolonization. Through a step-by-step process, we hoped to help Indigenous readers identify useful concepts, terms, and intellectual frameworks that will assist all of us in our struggle toward meaningful change and self-determination. 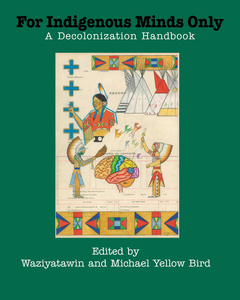 The handbook covered a wide range of topics including Indigenous governance, education, languages, oral tradition, repatriation, images and stereotypes, nutritional strategies, and truthtelling. Professional and Personal Development & Mentoring – relate. connect. be. Listen to this inspiring story about water, and how we are all related through water. Being courageous is hard enough in a world that sets judgement calls on how you look, what you wear, who your are and possibly sends messages about your value. Remembering that your self worth is your everything. Remembering our role as teachers and leaders that everyone has a space and needs to be respected for their individuality.